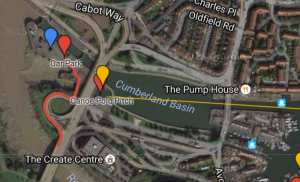 Bristol Canoe Club run their summer polo training at the CPFA Outdoor Pitch at the Cumberland Basin in central Bristol from 6-30pm every Wednesday. Both Club and Non-Members are welcome to come along and join in. More details available from polo-enquiries@bristolcanoeclub.org.uk. 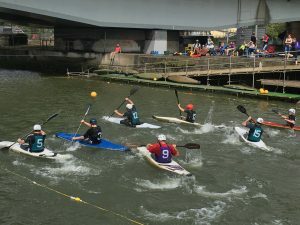 Bristol Canoe Club ran a Mini Canoe Polo tournament at Bristol’s Polo Pitch in the Cumberland Basin on Sunday July 23rd 2016. The teams consisted of two teams from Cardiff, the Bristol Penguins, a scratch Bristol Pitbulls and a University team. Congratulations to Cardiff B for winning the tournament. Great weather contributed to a really enjoyable day. Hope to see more club players and members next time.